In the rivers, springs and shallow coastal waters of Florida a seal shaped mammal called the manatee (more commonly known as sea cow) can be found. Fossil records suggest that the ancestors of these aquatic mammals belonging to the Order Sirenia may have been four footed land dwellers 60 million years ago. There are three species of manatees: West African (Trichechus senegalensis), Amazonian (Trichechus inunguis), and the West Indian (Trichechus manatus) manatee of which a subspecies can be found in Florida. During the winter months in America, manatees concentrate in Florida since they do not have blubber to keep them warm and hence prefer warmer waters. At other times of the year, manatees have been sighted from Louisiana to the Carolinas and Virginia. Clearly, they can survive in fresh as well as salt waters. At a glance, their grayish-brown skin is wrinkly and peppered with short bristly hairs. Stiff facial whiskers also dart from their bulbous puffy snouts. Their facial expressions are indicative of their overall behavior which is placid. Their tranquil expressions may lie in the fact that their eyes are small, close together, and recessed. Adults can reach 13 feet in length and weigh as much as 3,500 pounds. Females are often greater in length and weigh more than males. These gentle creatures, who spend more than five hours a day feeding on seagrasses, are endangered to the point of extinction. Their story is a familiar one - humans are the major threat to their existence. High mortality is caused mainly by boat propeller lacerations, high speed barge/boat collisions, water pollution, and the loss of habitat. A recent count revealed there are only 1,463 manatees left. The foremost concern is how to prevent continued loss and possible extinction. One way to prevent injury/death is to put a restriction on water boat speeds in known manatee habitats in the waters of coastal Florida. Since manatees do now swim very fast, boat speeds greater than 20 mph are too high for them to avoid collisions and propeller injuries. Speed limits should be restricted by law to less than 20 mph. Hopefully fostering and enacting such legislation would represent a start to the halt of a major cause of agony and death for these animals. Only when we realize that human actions are the root cause of the suffering of these placid beasts can we take the necessary responsible for their preservation. On the 500th anniversary of Columbus' contact with the New World, it is fitting to introduce Save The Whales members to the West Indian manatee (Trichechus manatus) , perhaps America's first marine mammal to amaze Europeans During their exploration of the "West Indies." Today, may people still find the manatee novel and mysterious. Derived from the Carib word manati, meaning "with breasts," the manatee was first recorded in print when a shipful of Columbus' half-crazed sailors saw several of the "sirens" off the coast of Hispaniola in 1492. 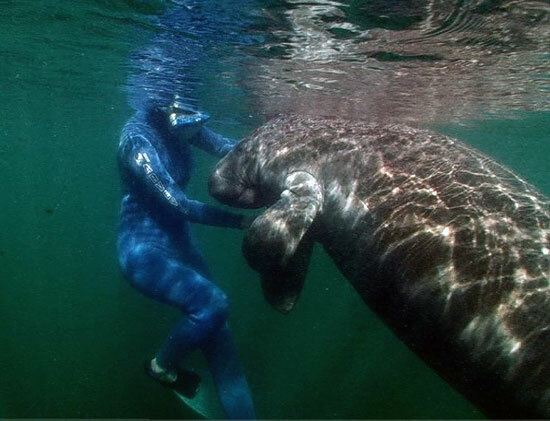 Myth has it that the sailors -- starved for female company -- upon viewing a manatee thought it was a mermaid. European sailors actually saw West African manatees (Trichechus senagalensis) off the coast of Africa decades before Columbus accidentally arrived in the Americas. Trade by ship between Africa and southern Europe was common by the 15th century, so it is likely that at least one of Columbus' crew saw his first manatee not in the West Indies, but off the coast of West Africa. The manatee is distantly related to the Dugong (Dugong dugon), a wonderful creature commonly known in English as the dugong. Dugongs are 100% marine mammals and occupy shallow coastal waters of the Indo-Pacific, where they are locally known in many different languages as "sea cow" and "sea pig." The only living member of the Order Sirenia with a falcate tail, the dugong looks like an obese dolphin with a cow-like head and inconspicuous tusks like those of a hippopotamus. The West India manatee is most closely related to the West African manatee which, in turn, is a kissing cousin to the Amazonian manatee (Trichechus inunguis), the only Sirenian that is totally restricted to a freshwater habitat. 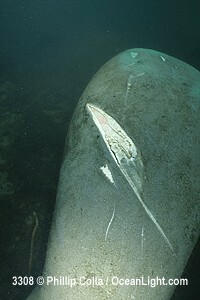 The West Indian and West African manatees are "edge" animals. Part of their time is spent in freshwater and part in sea water. They prefer bays, estuaries and river mouths where the mixture of saltwater and freshwater habitats provide a diverse food supply of aquatic plants. Weighing up to approximately 3,000 pounds and reaching 13 feet in length, adult manatees can be intimidating creatures when viewed underwater in their murky-green habitat. These nearshore leviathans are completely harmless, however, and upon closer inspection appear to be rather awkward, if not absolutely ridiculous. Unlike its very distant relative, the elephant, the thick-skinned manatee has a small, cow-like head, prehensile flippers, no hind limbs, and a large, wide paddle-like tail. Docile in nature and vegetarian in diet, manatees are basically buoyant bags of intestines incredibly well adapted for the most simple of habits: eating, eating and eating, hence their nickname "sea cow." Since they feed on poor-quality food (freshwater vegetation, sea grasses and algae), manatees have an extra large body to house the stomach and voluminous intestines needed to extract the few nutrients available in what hi-fiber food they manage to stuff in their very active jaws. The word besides bizarre that best describes the manatee is slow . To enhance their survival, manatees come equipped with a very low metabolism (second only to the sloth) that reduces their energy requirements, which in turn enables them to survive on an energy-poor diet. One of the "costs" of having a low metabolism is the need to have a warm environment where the ambient climate is basically "room temperature." To find that warm water environment, West Indian manatees can be found swimming along the Atlantic and Caribbean coasts of the Americas from Georgia to Brazil, including the Caribbean Islands of Cuba, Jamaica, Hispaniola and Puerto Rico. 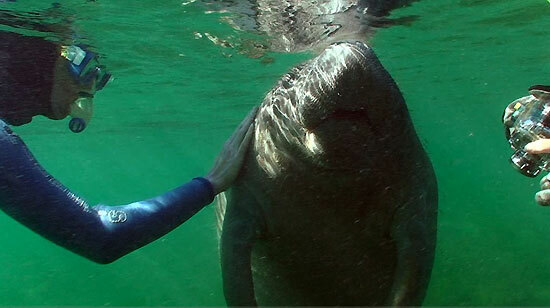 The best place to see a manatee in the wild is Florida in the winter, where the sea cows are attracted to the warm waters of power plant effluents and clear 72 degree groundwater springs. Aerial surveys indicate that the continental United States has a manatee population of about 2,000 (give or take a few hundred), mostly in Florida. Although 2,000 isn't an exceptionally low population number for an endangered animal, the plight of Florida's manatees is viewed in a more serious light when you consider that over 100 of the animals die each year in the United States. Manatees are dying from human-related injuries because of conflicts over land and water use. Each year, thousands of new residents move to Florida where they express their "right to enjoy the good life." Many of these new residents purchase power boats to take advantage of the excellent fishing and recreational opportunities in calm coastal waters. 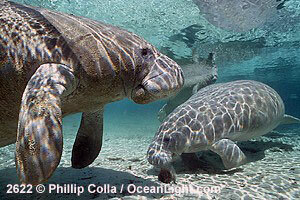 These are the same waters that provide food and shelter for manatees. A major problem with speed boats is that the slow-moving manatee (feeding, sleeping or swimming in the shallow water) has a difficult time avoiding the high-speed watercraft when it passes overhead, especially when the animal comes up for a breath of air. Another threat is the physical loss of habitat, such as when sea grass beds are destroyed by the construction of new marinas. Constrained by a tourism economy and high rate of population growth, the state of Florida finds it increasingly difficult to balance the needs of wildlife with the needs of the local economy. The manatee is a symbol of the conflict, and its fate in the United States will be determined by what Floridians value more: the management of public lands and waterways for short-term economic growth, or the management of public lands and waterways for long-term critical habitat conservation and endangered species protection. The organization most responsible for the public's awareness and advocacy for the manatee is Save The Manatee Club (SMC), a ten-year-old nonprofit organization with an international membership of 32,000. To support SMC in its efforts to protect the manatee, call 1-800-432JOIN or write Save The Manatee Club; 500 North Maitland Avenue; Maitland, Florida 32751. I encourage anyone traveling in Florida, especially in the winter, to take advantage of the unique opportunity to see this endangered mammal in the wild. Simply visit Blue Spring State Park, Homosassa Springs State Wildlife Park, or Crystal River...you will have the thrill of a lifetime. Larry is a former research assistant with Fish and Wildlife Service. He has studied manatees in Florida and Jamaica and continues his work with manatees as a naturalist with Oceanic Society Expeditions.